I like both jackets - one is more summery obviously so it would depend on the weather and how sunny my mood was. Love roomba too! I didn't even know what a roomba was until I visited Sveta! Seriously -- the things you learn on YLF. This is a great outfit any which way you wear it. I would, as Shevia says, follow the weather and my mood. Also, you didn't say where date night is. It might depend on the place a bit, no? Ah, I prefer the sequins! I like the mix that you have going on in that picture. 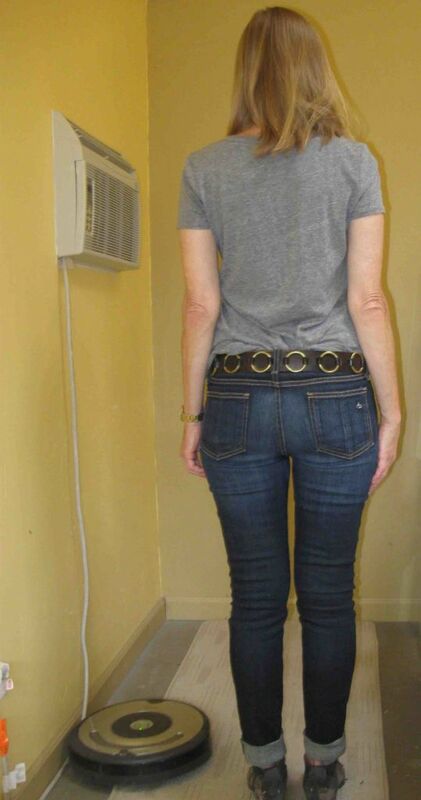 I like the back pocket placement on the jeans! I vote for the first one. Very fun and different. Looks more festive for date night. #1 for a warm summer evening sounds perfect. #2 looks great also, but perhaps that's more of a fall, cooler weather look. I think both look super. I think the first look is more summery so I might nod to that but you make it hard to decide! I think they both look great, just different vibes. I think #1 is fun for a more festive, modern vibe. 2 is more expected rocker chic. They are both awesome but I would go with 1. My thought process is that the leather jacket probably gets more wears so I would seize any change to wear the sequins. I am not a good housekeeper. (I prefer hiring one, but those days are in the past.) So the Roomba is perfect, and much cheaper. I didn't buy it, my Mom did. But she's such a picky housekeeper, it wasn't good enough for her, so she gave it to me. I'm thinking of going with the sequin jacket, I wear it all the time. I can't believe I almost sold it on eBay a few years ago, it is a workhorse. I like both jackets (the sequined one is delicious!) so I'll go along with those who say let the weather, venue & mood of the moment decide. Love the sequin jacket for you. It looks great for date night. Either looks good. But yeah the sequin is more fun. Nice watch! Happy Birthday Denise. Love the watch. My vote is for the sequin jacket & you have the best fitting jeans :) :). Great watch! I vote the sequin jacket too, more fun. I vote for the first jacket. I love how unexpected it it. TO me it brings the whole look up a notch. as others have said i love both versions. #2 is straight up rocker chic, #2 is more like taylor swift rocker chic…. A vote for the black jacket...i like the proportions on you. they're both good so it's more about preferred vibe of the moment, liking the jacket. Hard to choose -- #1 does seem more like summer colors and is beautiful on you. But I also love #2. More roomba love here. We have wood floors and live in a pretty dusty area (aside from the recent wet spell). I barely ever pull out the big vacuum. I just wish they had a way to clean stairs!